Anytime you may forget your password. Or someone who knows your password may change it to challenge you! That’s why Windows XP has a system to create a reset disk for forgotten password. No matter how many times the password has been changed. This disk will allows you to reset the password until you re install Windows XP on your system. And if you're using Windows 7 or 8 then Read This. And don’t be confused. This reset disk only work with your computer. It will not work in any other system. 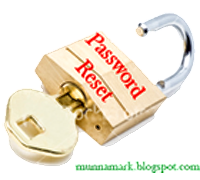 To create a reset disk, all you need is just a USB flash drive and your current password (if any). Caution: Anyone can change your password using this disk! So, keep it in your safe. Get Weather Forecast by Windows 8 Weather App! Download & Install Marks PC Solution Toolbar! How to Create Menu or Tabs in Blogger Blog?